Spring is fast approaching, and it’s high time to start getting ready for the warm weather. I know — it's freezing out, and it seems a little crazy to be daydreaming about spring clothes. But this Spring/Summer is all about bright colours and bold prints. So, it’s the right time to ditch the dark and heavy Winter clothes and go for something colourful and trendy, must-have pieces of the season. I'm sure you all figured out that neon is an absolute hit of the season. Embrace the Spring spirit in a loud neon coloured dress. From dresses to shoes, handbags to hair or nails; everything is going neon. 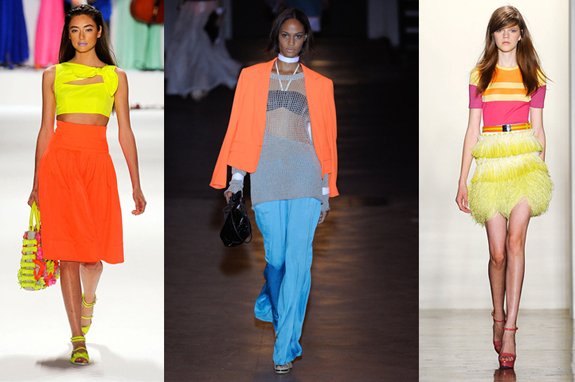 Get ready to bring a pop of electric neon colour to your wardrobe. Hot pink, citron yellow and lime green shades seem to be everywhere this season, but if you’re a little colour shy, this trend could be an intimidating one to take on full force. The key to stay true to trend is never wear many neon pieces at the same time. .
the easiest way to incorporate neon into your wardrobe is through accessories. Neon scarves, belts, shoes, handbags and jewelry are all simple and inexpensive ways to add a punch of colour to any outfit. Choosing to wear just one piece of neon clothing with a neutral colour palette allows the bright colour to be the true focus of the outfit, creating a bold, yet still relatively tame look. you can choose any neon hue you want, Black and neon are total opposites in the colour world, but they work so well when paired together. Wearing bright neon with sleek black clothing and accessories not only creates fantastic contrast, but also makes for a daring look that’s sure to get you noticed.